(3) Figures in brackets on the right hand side indicate full marks. (4) Neat illustrations and legible handwriting will be appreciated. (5) Answer should be brief and to the point. (6) Assume suitable data if required and specify the same clearly. a) UCR masonry in cement mortar 1:2 in foundation up to plinth. d) Prepare an abstract of cost for the items of works specified above. 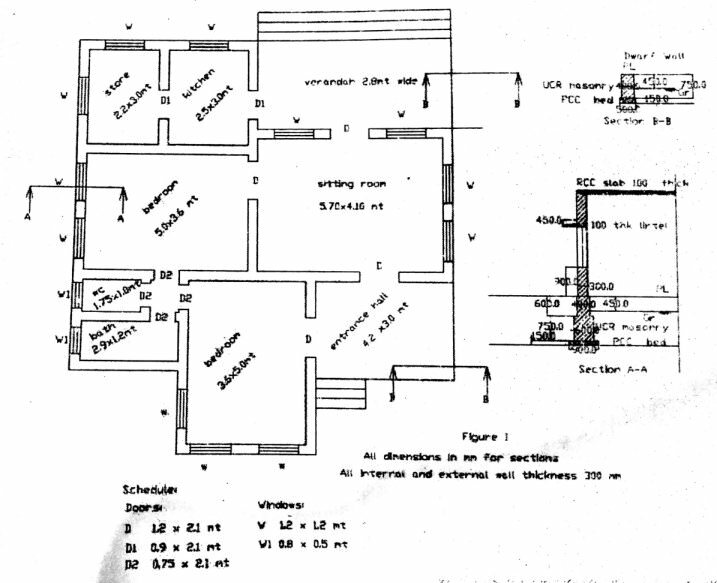 2(a) Prepare rate analysis for M20 R.C.C concrete with 1% steel including centering and shuttering. 2(b) Draft a tender notice for construction of hospital building by CIDCO Navi Mumbai (Executive Engg) with an estimated cost of Rs one crore and duration of project is 24 months. 2(c) Differentiate between void and voidable contract. 3(a) Prepare approximate estimate for G+6 R.C.C residential building consisting of four flats per floor and each flat has a carpet area of 80 sq mt. Assume area occupied by walls and columns etc as 8.5% of built up area and area of circulation as 25% of built up area. Assume suitable percentages for services, contingencies and work establishment charges. 3(b) Explain the different types of specifications for items of construction work? Also explain the various principles of specification writing. 3(c) What is pre-bid conference and pre-qualification of tenderer? 4(a) Calculate the quantity of earthwork in cutting and in banking for the portion of road with following data. The road is uniform down gradient from point 'A' with formation level of 118.90, to a point 'B' with formation level of 118.10. Distance between two points is 320 meters. The formation width in cutting is 5.5 meters and in banking is 6.0 meters. Side slope in cutting is 1.5:1 and in banking is 2:1. Estimate the cost of earthwork by considering existing District Schedule Rates. 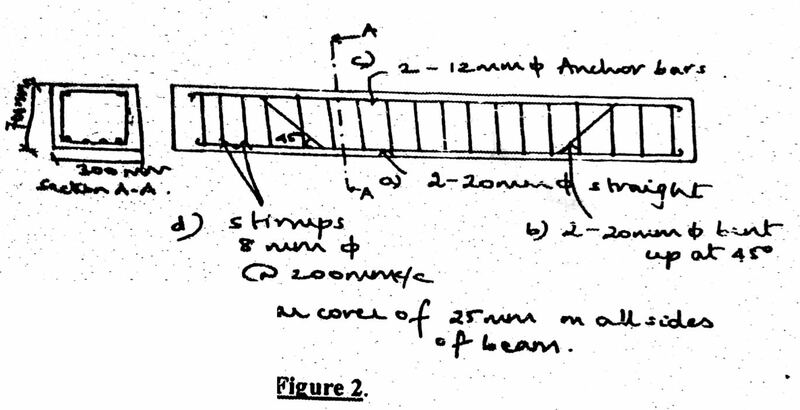 5(a) Work out the quantity of steel in a 7.0 meter long simply supported beam of size 300*700 mm overall. Bottom bar: 4-20 mm, diameter out of which two bars are bent up at 45 degrees at supports. Anchor bar: 2-12 mm diameter, stirrups 8mm diameter @ mm c/c throughout the length of the beam. Refer figure 2. 6(a) A newly constructed building cost Rs 70 lakhs on plot of valuation Rs 100 lakhs. Ten Flats of 120 sq mt each are constructed. Fix the monthly rent per flat from the following data. ii) Life of building = 50 years. v) Repairs and Maintenance = 3% of building cost. vi) Taxes and other expenses = 20 % of Gross rent.